Merry Brinkkoeter is the Assistant to the VP of Finance. 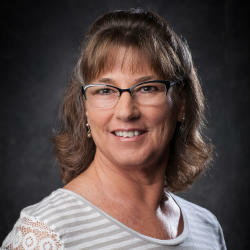 She joined the Chamber in 1999 as one of three Receptionists. Later she moved to the Accounting Department and is responsible for Accounts Receivable, billing and various other duties. She worked for National Oilwell which eventually became Trico Industries in San Marcos before joining the Chamber. She has done many things from Rodeos to Kart Racing. She participated in the Comal County Sheriff’s Posse drill team as a teenager and later raced go-karts at the local track on Loop 337 and she has raced over 100 mph at Texas Motor Speedway in College Station. In 2012 she graduated from the New Braunfels Police Academy Association and is a past Board Member of the NBCPAA Alumni. She volunteers at Anhalt Dance Hall in Spring Branch working the ticket booth at the monthly dances with her husband Art. Merry is a fourth generation New Braunfelser. She graduated from Canyon High School in 1978. She has been married to Art Brinkkoeter for 39 years. They have two daughters Sabrina Brinkkoeter and Kelly Kallies. She is “Granny” to granddaughter Madison Brinkkoeter and grandsons Treyton Kallies and Kason Kallies. What is one thing on your bucket list? I would love to go to the NFR Rodeo Finals in Las Vegas. Who is your favorite super hero? Wonder Women, I loved her “Truth” lasso. If you could go on a free vacation anywhere in the world, where would you go? Australia, but I would have to find a way to smuggle a Koala home with me.